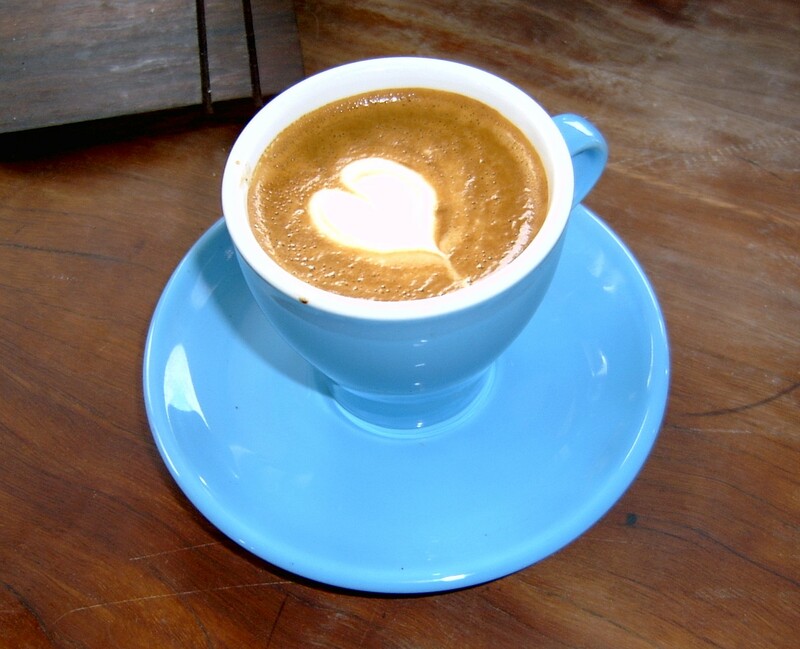 The flat white should soon be recognised as the single greatest Antipodean contribution to world gastronomy – so long as it’s made the Wellington way. I could make that claim because, on one hand, Australia had not contributed hugely to gastronomy (except such natural products as macadamias and kangaroo meat, and we got a highly influential symposium of gastronomy going as early as 1984), and, on the other, I happened to have gone on a flat white hunt through Italy, France, Denmark, Germany, England, Canada and the U.S. Pacific North-West. Milk coffee was surprisingly bad, although I finally understood in Italy how a cappuccino milk should be all fluff (and no chocolate sprinkle on top). 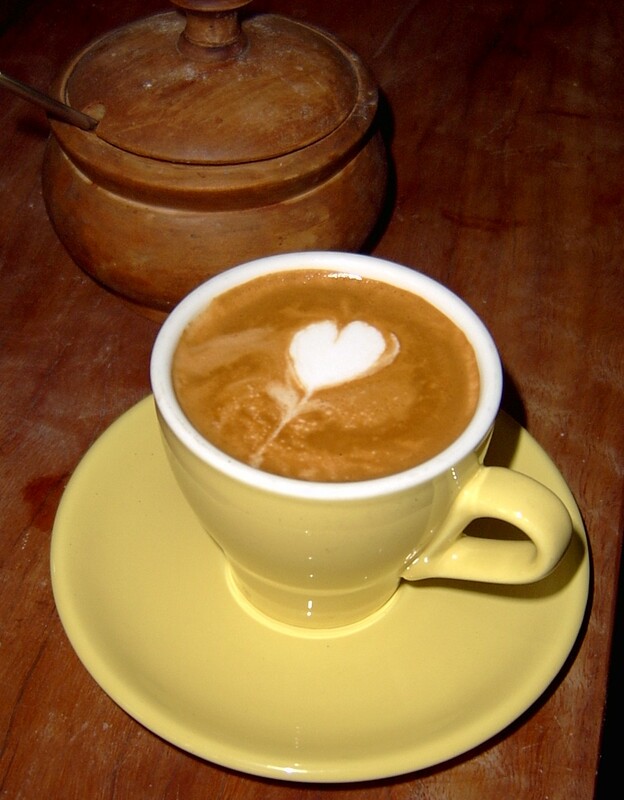 French coffee has since shown considerable improvement, benefiting from the take-up of micro-filtered milk (rather than the standard U.H.T.-tasting, so-called fresh milk). 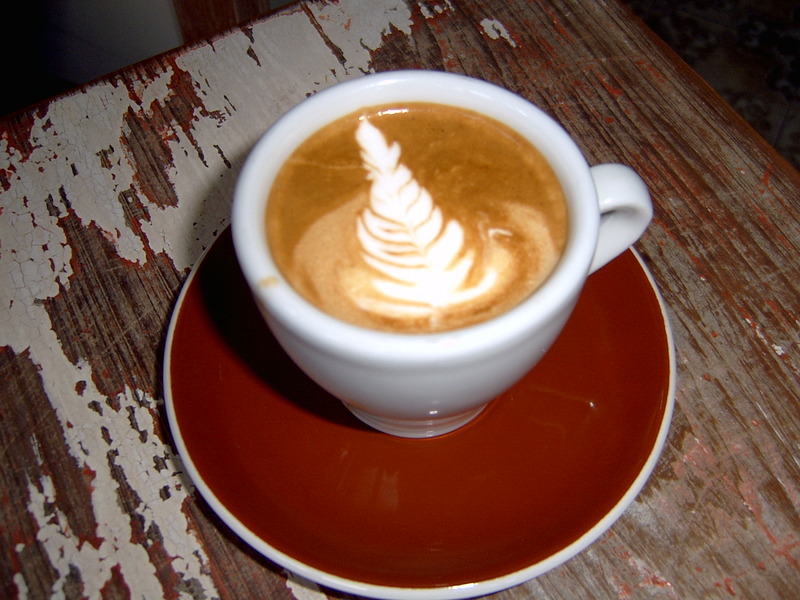 Only the baristas in Portland Oregon really knew their coffee, and could duplicate a flat white as a double ristretto, only “wet” (unfluffy) foam. Starting somewhere around 2005, the world scene had been improving, too, as Antipodean baristas took the FW to London and New York, and then France. (Don’t tell Australians, but NZ baristas were also usefully infiltrating Australian cafes. When we got back to Sydney, I had to purchase my own machine. Things have improved.) Starbucks started selling flat whites in the U.K. by early 2010, and I was silly enough to try one in London. They have just launched them in the U.S. (in March 2015). In a way, it was Starbucks’ second concession to Antipodean coffee culture – they had previously been forced to close a majority of their stores here, such was the relative espresso sophistication. One of life’s little thrills was walking out of Wynyard rail station in the Sydney CBD in 2008 to see workers taking down Starbucks signs at one of their very central, unprofitable shops. Analysing Starbucks’ almost total collapse in this country, an advertising person explained: “Unfortunately for Starbucks, what worked in the US was bitter, weak coffee augmented by huge quantities of milk and sweet flavoured syrups …For the Australian consumer, raised on a diet of real espresso, this was always going to be a tough sell.” At least by desperately advertising the drink, such chains make room for a customer’s revelatory experience provided by a real, preferably Wellington-experienced barista. 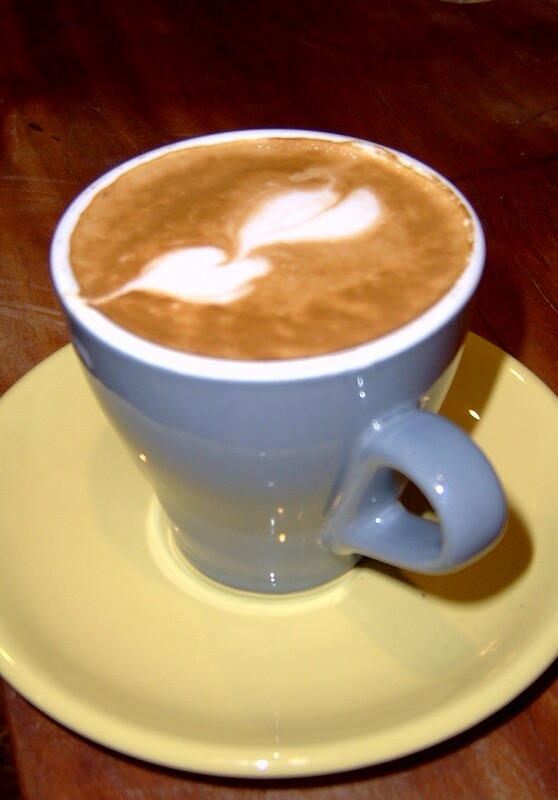 THE FLAT WHITE: A double shot of espresso, making around 30ml in a 160ml, usually tulip-shaped cup, topped with carefully “textured” or “stretched” milk (also known as “wet” or “micro-foam”, as opposed to “dry” or light, cappuccino foam), and at a hot but not burning temperature. 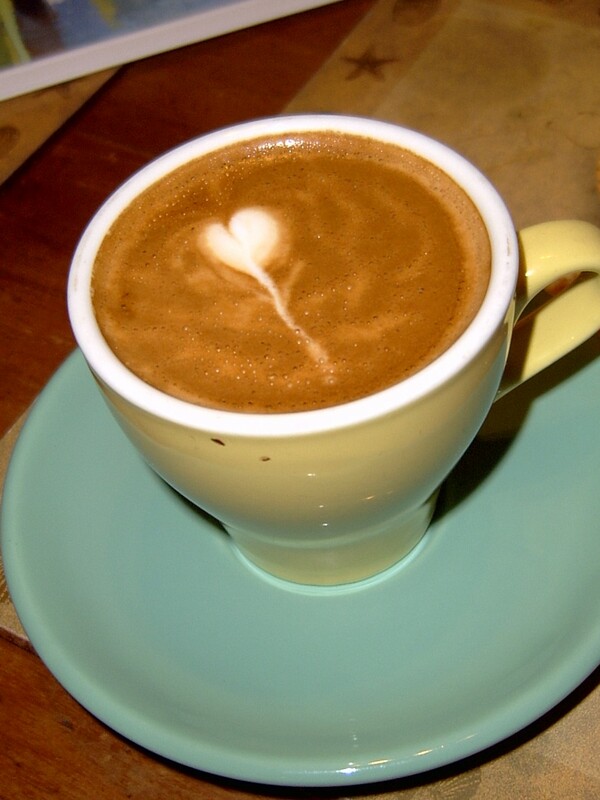 The finishing latte art shows the New Zealand fern emblem or the similar rosetta elsewhere (I must photograph one; for the moment, another heart). Once you are getting the milk-coffee balance, the secret is attention to every step: high-quality arabica beans, not overly roasted, a week or so after roasting (and no more than a dozen days old), freshly ground; a clean machine, run for 25 to 30 seconds; starting with cold, full-cream milk in a small quantity (at most enough for three drinks); steaming that creates a vortex without bubbles; served immediately in a ce ramic (never plastic or paper) cup. Espresso requires at least a domestic version of a professional machine. Mine is a “Rocket”, aka ECM Giotto. Grinding is crucial, too, in this case a Mazzer Mini. Thanks, Julie. Having previously assumed a piccolo caffè latte might be either too pretentious or too piccolo to bother with, I was nevertheless stung by your comment to experiment. 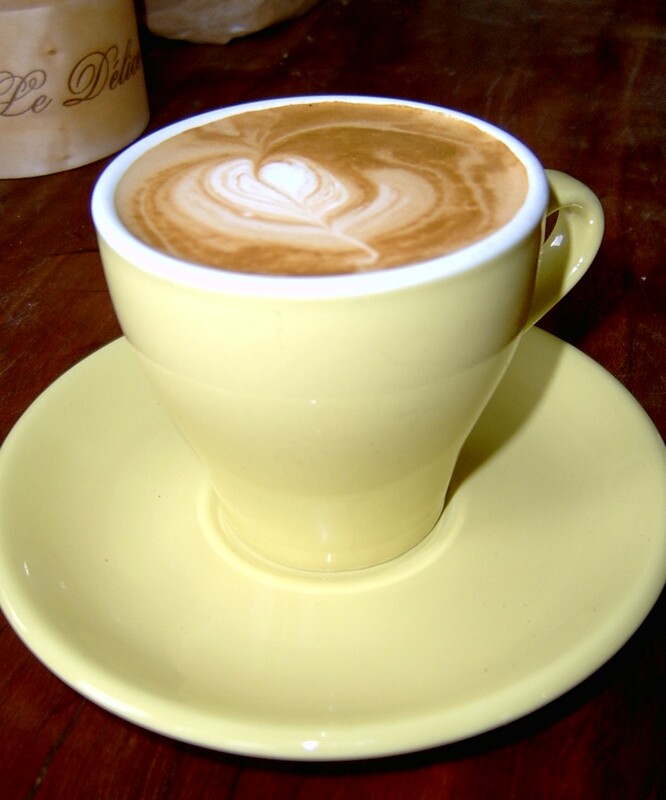 There’s no authoritative way to make any coffee, and that includes piccolo lattes. Without getting too technical (I couldn’t), my researches found that it’s either a shot of espresso or a double ristretto, along with textured milk to fill a 100 ml glass. In the first case, it is a weak flat white and, in the second, a strong flat white (assuming a flat white to be what I call the “Wellington” version, and so requiring a 150-170 ml, probably tulip cup). And that’s how it proved this morning – either a weak flat white (good for nothing much) or a strong flat white, and therefore more a coffee with milk than a milk coffee, if I can put it that way. To make the claim again: a flat white perfectly balances coffee and milk. Incidentally, the weaker piccolo must be close to a half-sized caffe latte (caffè e latte). So, have I got the gradations right: Caffe macchiato, strong piccolo, flat white, weak piccolo/caffe latte, latte macchiato? And, separately, black coffees (short and long) and, separately again, cappuccino, with fluff. Finally, do you think a piccolo preference could be cultural cringe, in that a “piccolo latte” sounds somehow more authentic than “flat white”?